THEORY #1 - GISLEBERTUS THE COUNT: For those of you who love that Autun Cathedral and the sculptural program there, this fairly new theory by Linda Seidel may come as a surprise. For a long time, it was thought that Gislebertus (and his workshop) were responsible for the sculptures here. This well-founded assumption is based on the inscription, Gislebertus hoc fecit ("Gislebertus made this") which is located underneath the text of Christ in the Last Judgment tympanum (c. 1120-1130 or 1130-1145; see detail image on right). It sure seems like Gislebertus was the sculptor based on that inscription, right? It was unusual for Romanesque sculptors to sign their work, so Gislebertus has received quite a bit of attention and recognition in the art historical world. However, Seidel argues that Gislebertus wasn't a sculptor at all. She finds that he was a late Carolingian count who might have contributed financially to the Autun Cathedral. Count Gislebertus made significant contributions to local churches, and his name might have been included in the tympanum in remembrance of his patronage. Seidel even goes further to suggest that this inscription may "challenge those in power to respect and continue the venerable tradition of patronage. 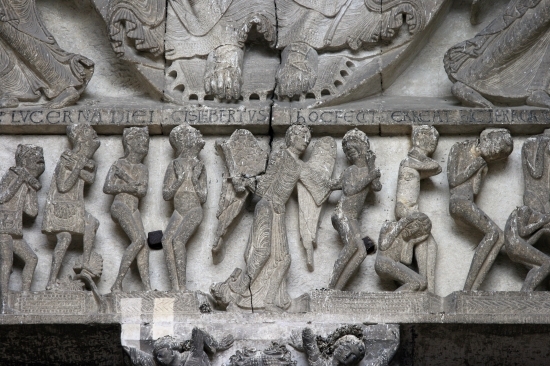 "1 For more information, I would recommend Seidel's book, "Legends in Limestone: Lazarus, Gislebertus, and the Cathedral of Autun" (1999, University of Chicago Press). I haven't read Seidel's book myself yet, but I look forward to checking it out. I think this theory is quite compelling. And regardless of whether Gislebertus is an artist or count, I "heart" him all the same. I've always remembered when I first learned about the "Hildegard and Volmar" frontispiece of the Liber Scivias (original 1150-1175, facsimile shown on left) as a student, since my professor joked that the stylized flames of fire (representing Hildegard's vision) looked like tentacles. I can't remember his joke verbatim, but it was something like, "and we can see in this manuscript that the Spirit of the Lord descended on Hildegard like a squid." All joking aside, I'm very interested in the new(ish) theory regarding the Liber Scivias. 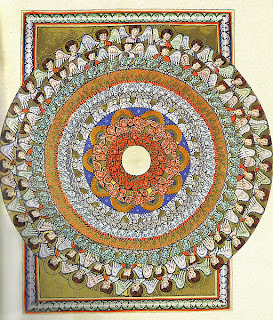 This book is a text that contains descriptions and illustrations of Hildegard of Bingen's visions. 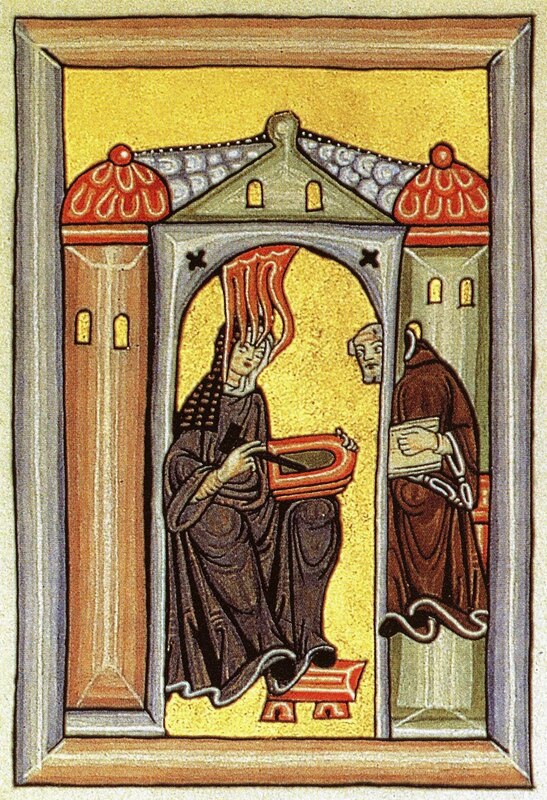 This theory by Madeline Caviness proposes that Hildegard might have been the designer for the illustrations for her visions. Caviness supports her argument in two ways: 1) She finds that these depictions of visions of very unconventional and 2) She thinks these designs also conform to some of the "visionary" aspects that are experienced by people during migraines.2 Hildegard had migraines throughout her life, but especially during the period when she was composing the Scivias. I think this is another interesting argument, and I to think that many of the designs are quite unconventional and unique. 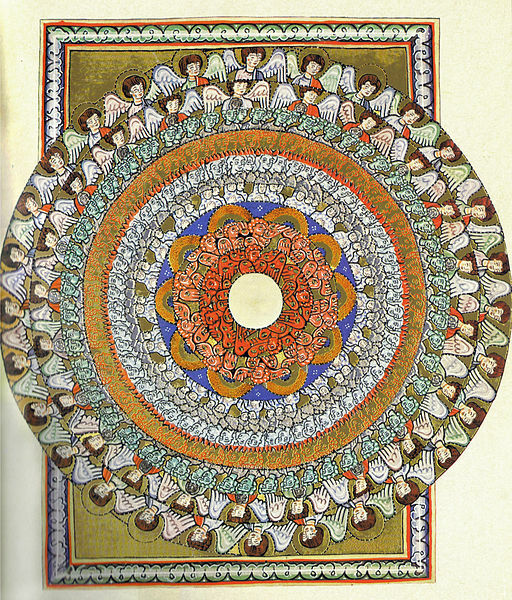 One of the images that I like is the "Vision of the Angelic Hierarchy" (1150-1175, shown right). You can see read a synopsis of Hildegard's visions (and see some small images for some of the designs that may have been created by Hildegard) by looking here. I hope I can get my hands on a copy of Caviness article; I'd like to learn what "visionary" aspects of these illustrations compare with the effects produced by migraines. More information can be read in Caviness' article, "Hildegard as the Designer of the Illustrations of her Works" (1998, Warburg Institute). "Hildegard and Volmar" image courtesy of Wikipedia. "Vision of the Angelic Hierarchy" image courtesy of Wikipedia. 1 Stokstad, Art History (Upper Saddle River, New Jersey: Prentice Hall, 2011), 478.